South America: Amazon River basin, in the Guaporé drainage in Brazil; Paraná River basin, in the Paraguay River drainage in Brazil and Paraguay, and in the middle Paraná River drainage in Argentina. Males are larger, more colourful and have longer finnage than females. Females are silver and black with shorter fins. Keep this species in male/female pairs. 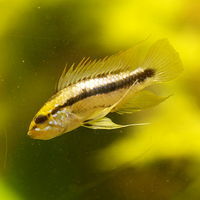 Tank mates should not be predatory and do not keep with other cichlids. Keep with robust and fast-swimming tank mates.